An onslaught of left-wing celebrities threatened to move to Canada during the 2016 presidential election if Donald J. Trump happened to ascend to the highest office in the land. Much of the liberal backlash against the future commander-in-chief stemmed from what some claimed was his "racist" anti-illegal immigration rhetoric. President Trump’s promise to secure America's border was deemed nativist, isolationist, and just plain mean. Canada seemed like their only hope for tolerance. But, now Trump is president. His immigration policies are being enforced. And this has the Canadian government telling illegal aliens that are looking to venture to the Great White North, "Don’t come here illegally, folks. It’s against the law." Randy Boissonnault, a liberal member of Parliament and a special advisor to Canadian Prime Minister Justin Trudeau, spoke to a variety of illegal immigrant groups in South Florida about what to expect should they choose to exit the United States and criminally enter into Canada. 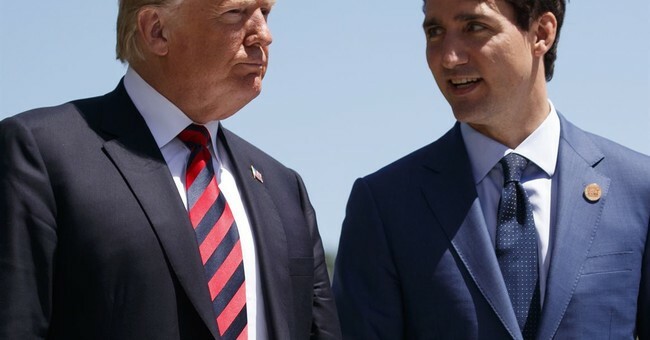 "People seem to think that if they cross the border there's this land of milk and honey on the other side," Boissonnault said while at the Canadian consulate in Miami according to USA Today. "What we want is for people to have the right information. We want them to do the right thing for their families." In the past year, Canada has seen bursts of U.S.-based immigrants crossing illegally into Canada, mostly into the Quebec province that borders New York and other northeastern U.S. states. In August, Royal Canadian Mounted Police caught more than 5,500 people trying to illegally cross from the U.S. Those were mostly Haitian immigrants who will soon lose Temporary Protected Status as part of the Trump administration's phase-out of the TPS program that has protected more than 300,000 people from countries struck by war and natural disasters. Apparently, Canadian officials have been traveling throughout the States since last summer to try and slow the tidal wave of illegal aliens. The influx of unwanted immigrants is so bad that, the Miami Canadian consulate "will have a new full-time officer whose responsibilities will include outreach to communities most likely to try to illegally enter Canada." It should be noted that Canada is "on pace to accept 310,000 permanent residents this year, with a goal of increasing the annual total to 340,000 by 2020. The Canadian government has also increased the number of refugees it accepts to help ease the burden on European countries that are overwhelmed with people fleeing war and famine in the Middle East and Africa. The country is planning to accept about 43,000 refugees this year, increasing that to nearly 49,000 by 2020"
But, still, even Canada does not advocate completely open borders. "Canadians are broadly supportive of immigration,"said Olga Radchenko director of parliamentary affairs for Canada's Minister of Immigration, Refugees and Citizenship, "But Canadians truly believe in order and well-managed immigration." Gee, a sovereign nation wanting to have a "well-managed" immigration system. Where have we heard that before? Well, Americans have heard it recently from a couple of different presidents. In the 1990s, President Clinton said, "We are a nation of immigrants. But we are also a nation of laws. It is wrong and ultimately self-defeating for a nation of immigrants to permit the kind of abuse of our immigration laws we have seen in recent years." Twenty years later, President Trump iterates essentially the same message on whitehouse.gov, saying, "The United States must adopt an immigration system that serves the national interest..These reforms will advance the safety and prosperity of all Americans while helping new citizens assimilate and flourish." Canadian officials warning against illegal immigration sound like President Clinton and President Trump. But, perhaps richest of all, are acting like President Obama. In 2014, President Obama established a marketing campaign in South American countries to warn against illegal immigration "through recent programs, such as information campaigns to deter migration, developed in response to the migration increase and other longstanding efforts." It was a total failure and ended up increasing illegal immigration. The Government Accountability Office found that these programs plus "confusing policy statements from the Obama administration were largely responsible for the surge of illegal immigrant minors last summer. 70,000 unaccompanied children poured through the southern border in 2014. On top of those numbers, 60,000 additional children came into the country accompanied by their parents, according to the GAO." Regardless, it is not racist for Canada or the United States to want to secure their border. Canada is comfortable allowing hundreds of thousands of refugees into their country and they have that right to do so. Just as America has the right to limit the number of refugees that come to the States. Both nations have the right to secure their border against illegal immigration, and it seems both countries are exercising that right in their own way.